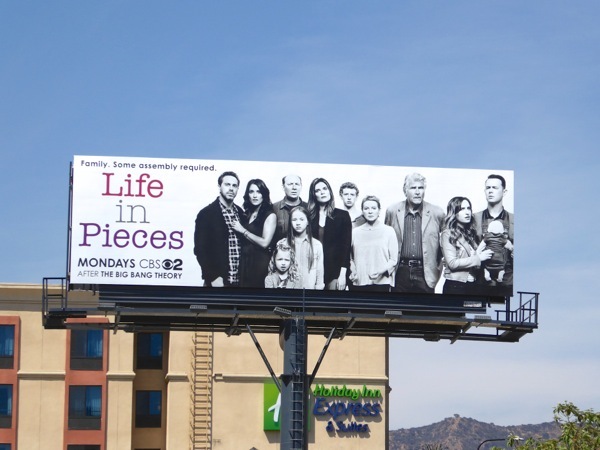 If you thought the cast of Modern Family was pretty extensive, wait until you get a load of the cast for the new CBS sitcom, Life in Pieces. 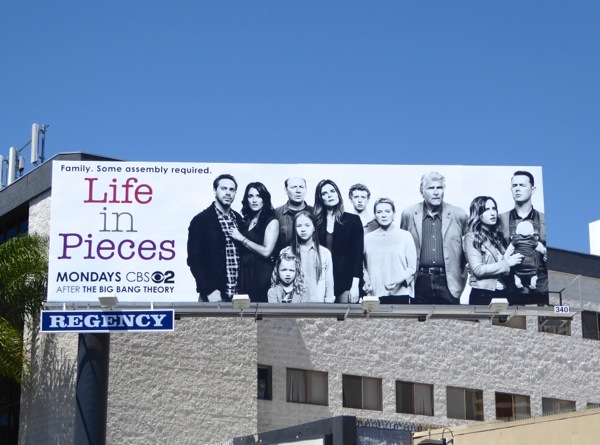 Meet the 'Short' clan, headed by matriarch Dianne Wiest and patriarch James Brolin with three grown-up children, played by Betsy Brandt, Thomas Sadoski and Colin Hanks. Each week the multigenerational, multiple point-of-view comedy will check in on the big happy family and their unique relationships as they navigate life's milestones. 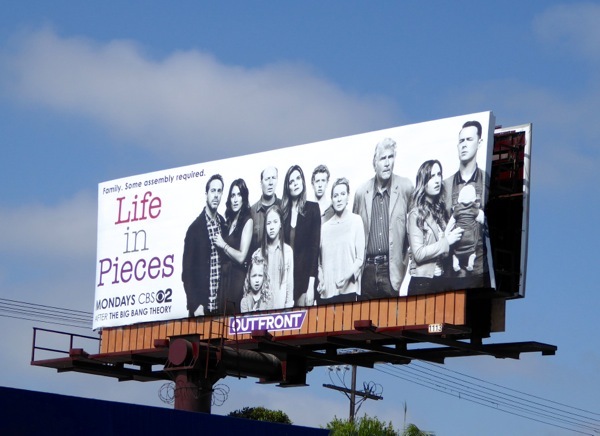 These billboards for the series launch of Life in Pieces were first spied along Santa Monica Boulevard in West L.A. on August 8, plus later along Pico Boulevard and Highland Avenue from August 23 to August 28, 2015. 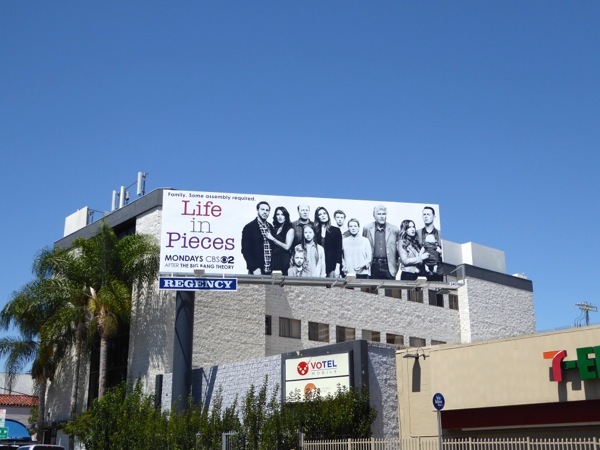 Even though the show sounds similar to other family comedies out there, they may be in luck this Fall season as compared to previous years there seems to be a distinct lack of new sitcoms and more of an emphasis by the networks on comic book adaptations, conspiracy thrillers, movie spin-offs and soapy dramas. 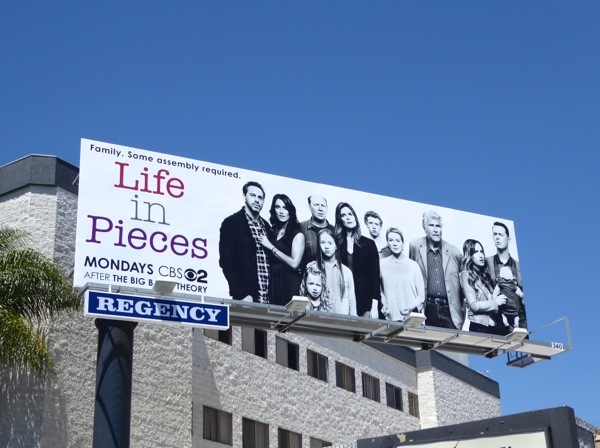 Only time will tell whether viewers will invite this new family into their homes, but if it does find an audience, CBS better be prepared for the expensive salary negotiations that comes with such a sizable cast.